Bodega Taco Bar has announced some very exciting news – their taqueria has gone mobile! Bodega’s Mexican street food (It’s DELICIOUS! Read more here about Bodega) will now be available in the streets from their NEW Bodega Food Truck. Be on the lookout for this green food truck that will bring Bodega’s innovative food to you at private parties, school functions, outdoor events, and of course, a streetcorner near you. 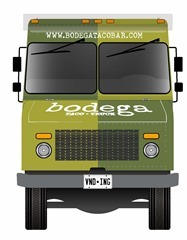 Bodega’s food truck will become the centerpiece of their catering business and offer catering menus that include everything from burrito bars to taco parties to passed hors d’oeuvres such as Tuna Tataki and Smoked Chicken Albondigas. Don’t forget the “hand slapped guacamole,” seasonal menus, and outdoor events like the Paella Party, Parrilla Mixed Grill, and the popular Whole Roasted Pig Fiesta! The Bodega food truck fiesta can also include signature cocktails – Bodegarita, Rosarita, Pomarita, Mojito, Alibi, and Sangria. To find out where the Bodega food truck fiesta is headed next, check out their twitter, instagram, and facebook pages (Fairfield FB page and Darien’s FB page. Be sure to look for the food truck on Bodega’s Cinco de Mayo WEEKEND celebration from Friday, May 2 until Monday, May 5th! Bodega Fairfield, 1700 Post Road AND Bodega Darien, 980 Post Road.